A US Senate committee has criticised military officials for the manner in which they developed interrogation techniques used at Guantanamo Bay. Pentagon lawyers testified to the Armed Services Committee that methods such as water-boarding were based on training given to soldiers on resisting torture. Chairman Sen Carl Levin said they had then "twisted the law to create the appearance of legality". The White House responded by saying the US had treated all detainees humanely. "Abuse of detainees has never been, is not and will never be the policy of this government," spokesman Tony Fratto said. "The policy of this government has been to take these detainees and to interrogate them, and get the information that we can get to help protect this country," he added. The lawyers' comments on the development of the controversial interrogation techniques employed by the US military and security services were released as part of the initial findings of a report by the Armed Services Committee. 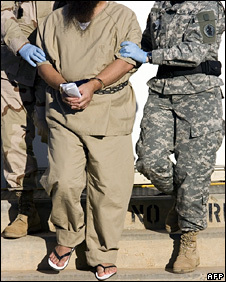 The Pentagon's general counsel, William Haynes, sought information as early as July 2002 - nine months after the 11 September 2001 attacks - about training given to US military personnel on how to resist enemy interrogation. The Survival, Evasion, Resistance and Escape (Sere) programme is based on the experiences of US prisoners of war in previous conflicts. Sere trainers provided Mr Haynes with a list of techniques, including sensory deprivation, sleep disruption, water-boarding and stress positions. Several were approved by the then Defence Secretary, Donald Rumsfeld, in December 2002 despite objections by military lawyers. Mr Haynes said he had been unaware of the legal objection from the military and that he had been doing the best he could to prevent further attacks. The committee also released details from previously classified minutes of a meeting in October 2002 in which a top military lawyer at Guantanamo said previously banned techniques such as sleep deprivation were being used secretly. "Officially it is not happening," Lt Col Diane Beaver told the meeting, adding that commanders feared the Red Cross might find out. John Fredman, then chief counsel to the CIA's counter-terrorism centre, argued during the meeting that torture "is basically subject to perception". "If the detainee dies, you're doing it wrong," he said. Discussing the testimony, Armed Services Committee chairman Sen Carl Levin, a Democrat from Michigan, said such comments contradicted the White House's argument that the cause of the abuse scandals at US detention centres such as Abu Ghraib had been merely the result of a "few bad apples" acting on their own. "The truth is that senior officials in the United States government sought information on aggressive techniques, twisted the law to create the appearance of their legality and authorised their use against detainees," he said. Mr Rumsfeld's endorsement of harsh interrogation techniques, Sen Levin said, had "unleashed a virus which ultimately infected interrogation operations conducted by the US military in Afghanistan and Iraq". "If we use those same techniques offensively against detainees, it says to the world that they have America's stamp of approval." Republican Sen Lindsey Graham said the lawyers' guidance would "go down in history as some of the most irresponsible and short-sighted legal analysis ever provided to our nation's military and intelligence communities".